One of the water projects that California voters approved is about to get underway. Workers are in the pre-construction phase of raising Shasta Dam up near Redding in Northern California , with geologists taking core samples to study the rocks under and around the Dam site. That all sounds good, but there are storm clouds on the horizon. An environmental group is trying to put up roadblocks that could stop the project cold. The project would raise Shasta dam by 18 feet, which would add 600,000 acre feet of water storage to the lake. 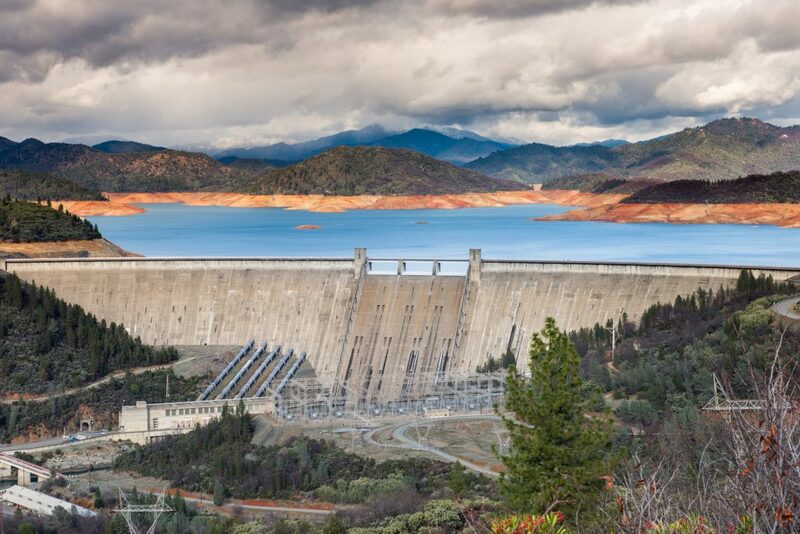 It’s already one of the tallest dams in the world, and Shasta Lake is the largest reservoir in California with a capacity of 4,500,000 acre-feet. As tall as it is. when it was first conceived, Shasta Dam was supposed to be taller – the plans called for an 800 foot high dam. Construction began in 1938 and continued through much of World War II. The war caused a severe labor shortage when much of the labor force volunteered to enlist. But the dam and the electricity it would generate was vitally important to the war effort, so the size was scaled down to get it finished as quickly as possible. Water storage began in 1944. Since that time, Shasta’s been the crown jewel of the Central Valley Project, storing almost twice as much water as any of the other lakes in the system. As big as it is, the dam hasn’t lived up to expectations as it was never built to its full potential. With the possibility of losing more Native American tribal lands and the continued heavy pressure from environmental groups, it may never be as big as originally planned. The current project could raise the water level by as much as 18 feet. An attorney for The Center for Biological Diversity says this increase could take out the only known habitat for the Shasta Salamander. They think that the higher water levels could drive it to extinction. A petition had been made to get it listing in 2012. So the environmental group is now suing to get the Salamander on the endangered species list. This could give them a way to get the construction project stopped. According to the attorney, they are not just thinking about the salamander, but the impact that raising the dam will have on other plants and wildlife like rainbow trout and the endangered winter-run chinook salmon. Construction could begin in late 2019 or 2020.